In 1967 LIFE Magazine published an exposé on organized crime in America. FBI Director J. Edgar Hoover admitted publicly for the first time that the Mafia did in fact exist and that the Gambino and Genovese families exercised ironclad control over the Waterfront Unions in New York and New Jersey. Director Hoover had for thirty years refused to publicly acknowledge that the Mafia existed, his conviction was that organised labour in America had much more to fear from Communist and Socialist control than from mobsters. President Nixon stayed true to the FBI spirit when he commuted the jail sentence of Teamster President and Mafia candidate Jimmy Hoffa. ‘Among the most unusual Federal Prosecutions during the 1980s were the weapons trafficking and murder solicitation trials of a rogue retired Officer of the U. S. Intelligence community, Ed Wilson. As detailed in Peter Maas’ book MANHUNT, Ed Wilson’s career offered a rare glimpse into the interactions between the CIA and the labour union movement. Recruited by the CIA while in college back in the dark days of the Cold War, the CIA first sent Wilson through the School for Industrial and Labour Relations at Cornell University in New York City. 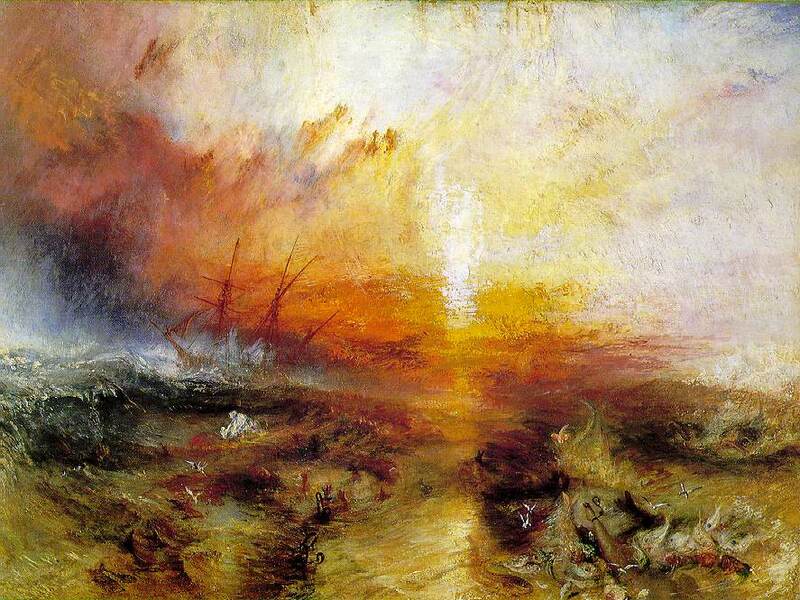 After graduation Wilson convinced Paul Hall, the President of the International Seafarers Union to hire him as an Organizer. Hall sent Wilson to Belgium, where Wilson infiltrated the Communists involved in the Union movement and performed various ‘dirty tricks’ against Labour leaders. Wilson then returned to the United States where he obtained work in the International Department of the A.F.L. – C.I.O. Wilson’s biographer relates that while the Seafarers were not aware that Wilson was in fact working for the CIA, the AFL-CIO was aware. This organization has long maintained close ties to the U. S. Intelligence community and to this day labour activists in the United States will jokingly refer to this organization as the ‘AFL-CIA!’ The AFL-CIO then sent Wilson to Latin America to infiltrate the various Communist-dominated labour Unions. The only point I am making here is that the labour unions are penetrated and controlled much more comprehensively by all sorts of political gangsters than from mobsters, entire union federations have been lost to independent workers. Next we come to violence and murder. 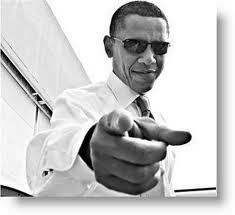 Let’s compare G8 leader Obama with the very worst of the Mafia killers, Louis ‘Lepke’ Buchalter. Who the heck was he you ask? Well he was another close associate of Lucky Luciano who back in the day controlled the garment unions of New York. In the 1930’s Lepke was a pioneer labour racketeer and he wasn’t even Italian, he was in fact Jewish. What made Luciano stand out from the other mobsters was that he wasn’t a nationalist, he learnt his trade from New York’s Jewish mobsters especially Arnold the brain Rothstein and many of his long time friends Frank Costello and Meyer Lansky, who were also Jews. It was this willingness to associate with mobsters from outside of the Sicilian-Italian community that set him on a collision course with the traditional Bosses like Joe Masseria and Salvatore Maranzano. Since all of the G8 leaders come to Fermanagh acting solely on the so called national interest, they walk at least one step behind the more open minded crime boss. Lepke had another string to his bow apart from labour racketeering – hiring mobsters that he knew to kill people on contract. In the early 1930s, Buchalter joined Charles “Lucky” Luciano and other Mob bosses to form the “National crime syndicate”. Luciano’s associates Benjamin “Bugsy” Siegel and Meyer Lansky formed Murder Incorporated a name applied to them by the media when the first court cases came to light. Originally a band of killers, they were used to fulfil many non-Mob related contract killings. Buchalter and his partner, Albert “the Executioner” Anastasia would take control over Murder Inc. when Siegel and Lansky’s business endeavours became respectable. Buchalter was responsible for contract killings throughout the country, including the killing of the Mob hit man and bootlegger Dutch Schultz. In 1935, law enforcement estimated that Buchalter and Shapiro had 250 assassins working for them, and Buchalter was grossing over $1 million per year in profit. They controlled rackets in the trucking, baking, and garment industries throughout New York. It is believed the corporate Jewish killers may have killed nearly a thousand people on contract before they were stopped. The killers were put on a retainer fee and paid an extra $5,000 when the job was done; the most prolific of them Harry Pittsburg Phil Strauss notched up over a hundred burns. If the killers were caught the best Jewish lawyers, money could buy would represent them, and their families were looked after. Their most famous hit was on one of their own; Dutch Schultz was planning to bump off special prosecutor and later to become a Presidential candidate Thomas E Dewey. The crime syndicate decided that Dutch needed to be taken care of as he was just so reckless. Lepke the best organiser of Murder Incorporated was eventually caught and executed in Sing Sing prison in March 1944. Now this is all very serious stuff but in terms of well-organised killing it is still small-scale stuff. Obama is openly referred to, even in a few of the mainstream media outlets, as the drone killer, the assassination President, and the police surveillance President. One person who’s been working hard to expose what he has been sanctioning is investigative journalist Jeremy Scahill, a long-time war correspondent for the Nation and the writer, producer of the startling new film “Dirty Wars,” which hits the cinemas in America just this week. “Dirty Wars” documents Scahill’s exploration of the campaign of drone strikes outside the recognized battle zone, in countries like Pakistan, Yemen and Somalia. He also found, after digging, the existence of the secret military strike force called the Joint Special Operations Command, or JSOC, which literally became famous overnight after the killing of Osama bin Laden. I think I have done enough to show there is a correspondence between the wicked ways of the Mafia Bosses and the self serving ways of the current crop of Political Bosses currently meeting as the G8 in Fermanagh. I never claimed that they were identical and I would have to admit that the Political Bosses often have to face more complex dilemmas. There is a serious case for the justification of Machiavellian politics which states that it is much easier for an ordinary person to refrain from doing bad things than it is for a Political Boss to do so. This implies that a Mafia Boss can simply decide to abide by the law without prejudice to themselves while a Political Boss has no such luxury, if he did he might well bring a heap of trouble onto the citizens of his country. The natural circumstance of politics is so extreme that the breaking of every moral convention and constitutional law is a sort of fait accompli for every potential the Political Boss. If you can’t stand the heat don’t even get into the kitchen. Professor Strauss seems to be indicating that the new Democracy of America was founded on the basis of a moral and political law that had no room for Machiavellian style dirty politics. The politics of the new democracies were intended to be different from the Roman politics Machiavelli had studied. The G8 seems to point to a higher standard by excluding China, the second economy of the world from their deliberations presumably on the basis that it is not a democratic State. Professor Strauss is famous for refuting what he called historicist accounts of political and social thought. What he meant by that was the thesis that the political philosophy of a certain historical period was necessarily bound to that period, so much so that it was an expression of it. So the harshness of Machiavelli political philosophy was merely a reflex of the division of Italy into warring city States and foreign kingdoms. The political thought of Thomas Paine was a reflex of a middle class capitalist development and the political thought of Karl Marx was just a reflex of the early exploitative industrial capitalism of the nineteenth century. We will not seek to rule on Marxism and historicism here but suffice to say that we don’t think Machiavellian or its alternative Marxist politics has been superseded by necessary historical developments. Machiavelli belongs to the long history of capitalism that includes the Italy of the city state and the merchant capitalism that originated in these very City States. The politics of imperialism are linked by the capitalist economy so private and public gangster politics are as relevant now as they were in Michiavelli’s time. The wiseguys are again meeting at a secluded location, not at the Apalachin retreat in upstate New York as depicted in the Godfather movie, they did that one back in 1957, but at a lakeside hotel in Fermanagh. The world’s most feared political gangsters are holding two days of much needed sorting out talks, for their dark mutterings and latent rivalries have reached a point of near breakdown in diplomacy. The quarrels between them have become so heated that they imply in an undeclared war over the future of Syria and beyond that you can see through in the ongoing currency war between them. It is my contention that there is a strong correspondence between the politics of the G8 and the Mafia politics of the recent past. When I say correspondence I do not mean identity. The political gangsters of today are therefore obliged to acknowledge a debt to the late great mafia boss Salvatore Luciano, the mobster who dreamt up the idea of a Mafia Commission to settle intense quarrels over criminal opportunities. Lucky Luciano established the Mafia Commission in 1931, a corporate body to mitigate the violent disagreements among the warring crime gangs. Luciano wanted to end the chaos that had led to a bloody and self -destructive gang war in New York and Chicago during the 1920s. In 1925 he was grossing over 12 million dollars a year and had a net income of around 4 million dollars after the cost of bribing the politicians, judges and police was deducted. But his private fortune was put in jeopardy by the intense gang rivalries, which escalated into a fierce street battle known as the Castellammarese War, that raged from 1928 to 1931 and resulted in the deaths of at least 60 top mobsters. So he looked for a way to lessen the strife and violence and found it in the Commission, a corporate body that has endured for over seventy years. Lucanio did not want to be an Italian- American Caesar. He realised that the best way for him to stay alive and rich was to let the most powerful crime families run there own internal affairs, but establish an administration to settle their differences and to mobilise enough combined muscle to crush any new rivals. He established a mob board of directors known as the Commission to oversee all criminal and business activities and to mediate strife between the contending families. It was to meet every five years and its decisions were non-negotiable. The Commission officially comprised seven crime families; the heads of the New York five plus, the Chicago Outfit of Al Capone and the Buffalo based crime family led by Stefano Magaddino. The Commission did not stop all gang warfare, but it did reduce the number and scale of them; when one gang transgressed against another it would often find itself at war with all the rest. There was no single ruler of the Commission, but there was a nominated chairman who was oath honoured to stand for the common good. The Commission largely succeeded, for what we find is that while the personnel of the ‘FAMILIES’ frequently changed, over time the same crime families stayed on top of the underworld from then until today: The Bonanno crime family, the Colombo crime family, the Gambino crime family, the Genovese crime family, the Lucchese crime family, the Philadelphia crime family and finally Al Capone’s Chicago outfit. They established a better capitalist crime model for themselves than the current rather shaky G8 one and it is the reason why Time Magazine once called Lucky Luciano one of the most influential Americans of the twentieth century. “I learned too late that you need just a good brain to make a crooked million as an honest million. These days you just apply for a license to steal from the public. If I had my time again I’d make sure I got my license first.” Lucky Luciano. The G8 – the people who got the licence first. If you succeed in politics you can usually surpass anything a Crime Family Boss can do in almost every division of life including killing and enriching yourself at the cost of others. Take Tony Blair for example. Everyone knows about his illegal and immoral acts of killing, but what of his wealth? Here is a report just picked up from reading yesterday’s newspaper (Daily Mail Saturday 15, 2013). Depending on how you cut it Blair is now worth £60 million or £80 million. He has set up a Byzantine network of inter-related companies to funnel his vast tribute for being a useful Prime Minister. Useful for whom you might ask, well useful for the Banksters. He has been receiving £1 million a year for advising the Abu Dhabi sovereign wealth fund where it is safe to invest their oil money. He is said to be as thick as thieves with the super rich Sheikh Hamad bin Jassim bin Jaber al Thani, the PM of Qatar. One of his other rewards for once holding political office came from the Kingdom of Kuwait – this netted him a swell £27million and his think tank was asked to produce a report on the future of the Kingdom called Kuwait Vision 2035. There is plenty more of that sort of stuff in the newspaper article. Tony Blair is an example of a political mobster of the very successful type. The thing that makes these ‘democrats’ different is that they have to wait to leave political office before collecting the readies rather than taking it while they are in office, say like ‘oligarchs’ like President Putin, another of the G8 stars. President Putin officially lists his salary at 5.8 million rubles, about $190,000 a good deal less than Obama’s official salary of $400,000. He also claims that he has very little personal wealth. 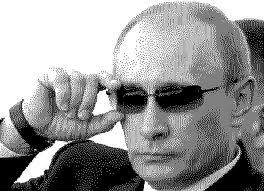 During his election campaign he claimed he had $180.000 in his bank account, owned three Russian made cars and a small apartment in Moscow, so a lot less than Obama’s personal wealth estimate of $12million. It might of course be argued that Tony Blair is a rogue politician, that the Heads of States of our Democracies are usually very different from him and therefore different from the Bosses of the Mafia Families. Yet ex-President Clinton has trousered a lot more tribute than Tony Blair and Obama will certainly get filthy rich when he finally hangs his coat up on the White House door. Some of our more notorious mobsters believe they have a good handle on the entire thing. Here are a few quotes from Al Capone about living in the world’s purest democracy. Al didn’t ever get too caught up in the whole democracy thing ‘capitalism is just the legitimate racket of the ruling class’. . . ‘This American system ofours, call it what you will, gives each and every one of us a great opportunity if only we seize it withboth hands and make the most it’. The mobsters can never fathom how they are doing anything different from the politicians and that often is their weakness, the bankers and lawyers of the democracies get the law on their side before they commit the crimes, or if they do the crime without the assistance of the law they get the politicians to amend the law to make sure they avoid the normal consequences of the law. In every episode of the Max Keiser show on Russia Today evidence is produced to demonstrate how the law is broken and amended to help the financial criminal elite of Wall Street and the City of London. In March of this year a US Senate committee compiled a 300 page report documenting the fraudulent and criminal practices sanctioned by Mr Blair’s favourite bank and the largest dealer in derivatives trading in the world. Despite all the evidence, no legal action was deemed appropriate, and the CEO Jamie Dimon remains a Consigliere to the President concerning the financial markets. The late John Gotti was once the Boss of the powerful Gambino family. is advice to the young included the following: ‘be nice to the bankers. Always be nice to the pension fund managers. Always be nice to the media. In that particular order.’ The Mafia ‘philosophy of self enrichment without conscience’ is perfectly suited to the present condition of finance-dominated capitalism. It is certainly difficult to spot the difference between what the law calls loan sharking and current legal lending. The loan shark figures a lot in Mafia books and films, the person or business that offers loans at extremely high interest rates and the smaller the loan the more onerous the repayments. In the early days of Mafia loan sharking it was confined to payday lending on potential wages with most of the customers being office clerks and factory workers. The 1952 film ‘Loan Shark’, featuring mobster favourite George Raft, depicts the whole payday loan racket. In the 1960s the Mob shifted their loansharking to small businesses as they had assets that could be confiscated if payment was overdue. The irony is that the Mafia historians tell us that payday lending to workers largely disappeared by the 1970s. Now of course they are back with the sanction of the law and the backing of the politicians. In Britain the Campaign group Debt on our Doorstep campaigns against the practice, if you are interested go to their web site for some horrific stories. One of the big players in the payday loan racket is Wonga, the sponsor of Blackpool football club. Last year it declared £45million in profit, by advancing over 4million loans. The annual interest rate on its payday loan is 4,214 percent. One of Wonga’s main stockholders is Dawn Capital, whose chairman is called Adrian Beecroft who is a donor to the Conservative party. The Prime Minister David Cameron asked his friend Mr Beecroft to prepare a report on the future of employment law and he recommended that employers be given the right under the law to sack workers at will and without explanation. The oily rag PM liked the idea but the Liberals thought it was a bit strong for now so it did not become law. Once again the immoral activities of the Mafia mobsters have been superseded by the legal activities of the political gangsters. Lets move on to tax. The Mafia bosses never like to pay tax, they are very much in the low tax political camp. This brings us to Al Capone; in 1927 it is estimated he made about $100 million, the equivalent of about $1.2 BILLION today. Despite his profession the authorities could never pin a serious crime on him with the Treasury Department attributing this to his ‘natural Italian secretiveness.’ He was maybe helped by the fact that no witnesses would testify against him, but the main reason was he was generous with his money. It is estimated he spent over $30 million in 1927 on gifts to politicians, judges and police chiefs. This of course is an example of trying to get the victims of the capitalist system on to your side when you have just become undone and disgraced politicians frequently play this populist card, nevertheless we appreciate the point. Many respectable people got rich during the prohibition era by selling alcohol as a legal medicine. The fine novel ‘The Great Gatsby’ is a fictional account of a legal medicinal bootlegger. The father of the Kennedy political dynasty held such a licence and he used it to stock his warehouses in the period just before the end of prohibition. Let’s now add a little bit more beef to his speech from the G20 meeting in Mexico 2012: “Every country sets its own tax rates, but I think in a world of global capital, in a world where we’re competing with each other, in a world where we want to send a message that we want you to build businesses, grow businesses and invest, I think it’s wrong to have completely uncompetitive top rates of tax.” The oily rag PM is just playing with the public over tax. Consider this snippet from a recent white paper covering the status of the UK oversees territories: the UK’s parliament has “unlimited power to legislate for all its overseas territories and crown dependencies”. He is putting on a show as if to say all he can do is try to persuade Bermuda, Cayman Islands and the Channel Islands etc to play fair on tax, when he could command them to do so. They will of course carry on as before and Cameron will stand back and shrug his shoulders. You should not be fooled into thinking that the British government is responding to the campaigns of the NGO’s to make tax on companies into a social issue. What he is defending Britain from is criticism from the other G8 political leaders, especially that coming out of the Congress in Washington who think the political class in Britain have effectively turned the country into one big Tax Haven to the detriment of Uncle Sam and others. Ireland is in the throes of an economic slump with official unemployment at nearly 15 per cent despite emigration. Severe cuts are being inflicted on essential public services; there are large cuts in take home pay and glaring inequality as the wealth of the richest in society has actually risen in the last few years. So how do we explain that in one corner of Ireland four thousand of the plain people of Ireland demonstrated in support of a man who was very recently the richest man in the country and who was at the centre of a disastrous attempt to buy the most rotten of Ireland’s very rotten banks? 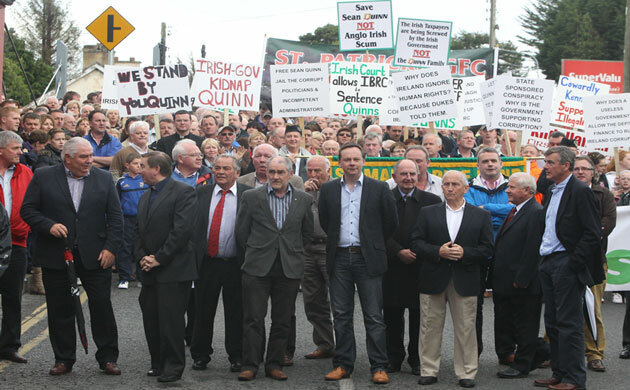 In a small corner of County Cavan thousands demonstrated in support of Sean Quinn as he dodges and dives to keep large bits of his foreign property empire out of the hands of the successor to the Anglo-Irish Bank from which he took out loans to buy the property but is now unable to pay back. The property was security for the loans and now that he can’t repay the loans the State, through the Irish Bank Resolution Corporation (IBRC), wants the property. In effect the local population was demonstrating in favour of Quinn holding on to this empire by underhand and devious means ,to keep it out of the hands of a state bankrupt and making huge cuts that affect those demonstrating as much as anyone. In this he was supported by a local and high-profile priest, by a local Sinn Fein MP and by a number of senior and well-known figures within the Gaelic Athletic Association. The columnist Kevin Myers once wrote that he could imagine Ireland without Fianna Fail, without the Irish language and without the Catholic Church but he could not imagine it without the GAA. Especially in most of rural Ireland that is how important the GAA is to local society. It is such a huge and varied organisation that it cannot be said that the GAA as a body supports Quinn but the members present were too numerous and prominent for the relationship to be simply dismissed. Sean Quinn’s brother Peter is an ex-President of the Association and a further ex-President Sean Kelly, a Fine Gael MEP, also issued a statement in support. I was having a conversation in the car with my other half when she said that they all had one thing in common – they were all men for whom it is always about them. When I also pointed out that it could be said they were also all quite well off, Catholic or ‘culchies’, she thought for a moment and said – no, it’s all about them being men with their masculine egos. Then I said that the worst aspect of all this was that so many ordinary people had come out to support him but she disagreed with this as well and said they were demonstrating because he had given them work. Quinn is by far the biggest employer in the area with cement and glass businesses, a large hotel and latterly branching out into insurance. It was his €2.3 billion gamble on buying Anglo-Irish Bank that brought this business empire down. There seems little recognition locally however that not only has he sought to deprive the state of much needed funds and caused an increase in everyone’s insurance premiums required to pay for his mistake but he gambled with people’s jobs to enrich himself when he was already filthy rich. Now, while claiming through tears, that he is a victim, a man with plain needs and modest life style he has ensured that his relatives have been paid hundreds of thousands of Euros from the Russian property companies that he is trying to keep hold of. The wife of his son has, for example, been paid €320,297 after tax by a Russian company owned by the Irish State while being a part time receptionist at a motor dealership in north Dublin. Yet people on a fraction of this came out to declare that he has been hard done by! For some the demonstration of support is but the latest expression of a long lived Irish slavish mentality that has much in common with peasant attitudes of supine deference to a local feudal Lord. The great and the good declare the Lord one of us and the serfs oblivious to their real interests blindly obey their masters and betters. Such a view however is only possible from outside. Cavan and Fermanagh are not some atavistic backwater with ignorant peasants innocent of the sophisticated ways of the modern world. What is in evidence is not some centuries-old peasant tradition of subservience. The rural location gives some apparent justification to such views but the industries they work in are modern, few make money directly from the land and they are as educated as anyone in the country. What is expressed is a particularly personal and local phenomenon of dependency which characterises the whole country and which is only particularly noticeable because of the scale of the local dependency. The obvious power of the Quinn family in economic terms has been extended naturally into an ideological and social power over the local community and become repulsive to many only because it is so personal and accentuated by the local circumstances. Expressed in a rural idiom it is easy and tempting for others to ridicule and mock but such acerbic criticism has much bigger targets if it were only to look. In what way is the subservience of some of Cavan people any different to the subservience of all the people of the Irish State to an unholy trinity of State, banks and property developers who have placed on their shoulders a debt so huge that their children will be paying for it for decades to come? In what way is the willingness to support the local Lord any different from the near universal political agreement across the State that the richest multinationals, including speculative financial institutions, should shape economic and social policy, despite the economic disaster they are so closely associated with, while the poorest and most vulnerable must suffer? If the slavish dependency of some people in Cavan offends so much why doesn’t the much greater dependency of the whole country not also? 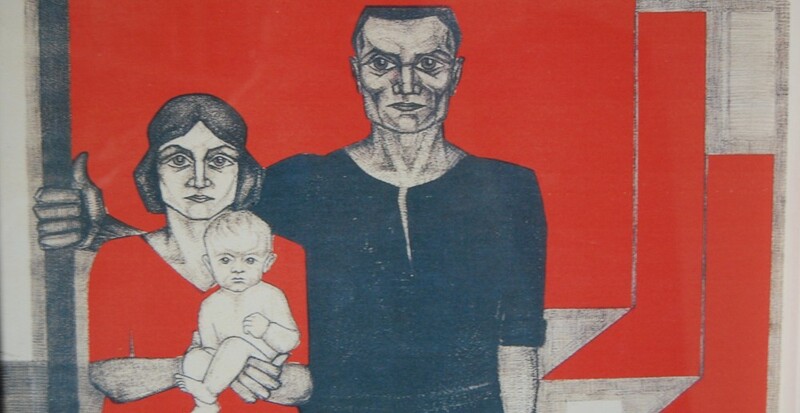 The exhibition of subservience witnessed in one part of rural Ireland is not to be excused. It must be understood and above all recognised as simply a particularly obvious reflection of the exploitation and oppression of the working people of Ireland. In this respect it is fundamentally no different from the position of workers anywhere. The notion that Quinn gave people work is accepted as fact just as capitalists employ workers while workers are employed. But Quinn didn’t give people work, the people gave work to Quinn and he gave them back an amount of money worth less than the work they provided. Under a system of private ownership by capitalists of the means of production it is nearly always the case that it appears that the capitalist gives work to the workers, and it is not that this is a pure illusion. In a very real sense workers do depend on capitalists for jobs, which they create and destroy regularly. This dependency and its results become obscene in some circumstances but it exists everywhere. It’s time that working people, some of them, started to put forward an alternative, starting with the left and not one that presents the state as the fountainhead of this alternative. The alienation of people in Cavan from this state (and the banks it supported), easily pictured as a remote Dublin cabal, is a distorted reflection of what would otherwise be a healthy impulse. After all, for socialists the alternative to Quinn is not the Irish Bank Resolution Corporation, is it? Boyd Barrett is correct to tear into the policies of the government, which favour the rich and places the burden of austerity on the rest of us. He is absolutely right that this is not inevitable and that there are choices. Above all he is right to demand taxation of the rich in order to press this home so that workers should not meekly accept that they suffer while the rich escape. In my last post I criticised the ULA’s tax proposals but not for any of these reasons. They were criticised for the idea that they could really take the wealth off the rich, that this could fund real protection against austerity, that the rich would not fight back and that the state would not help them do so. Above all they were criticised because they were put forward as being practical, realistic and reasonable because they could be implemented by the state, when in reality all these things are determined by class struggle against the rich and the state. All the points made by Richard Boyd Barrett can be supported precisely because they are all arguments for and within the class struggle. While I may disagree that “only people power, protests and strikes can challenge this obscene injustice” this difference is one of strategy to be adopted by workers, which is of a different character than criticism of a policy based on explicit reliance on the state. In such strategy the excuses that the rich will evade tax would be turned against the state to demonstrate its incapacity to enforce a fair and just tax system as perceive by the majority. The evasion by the rich would then be held up as a reason to demand expropriation of the source of their wealth and for refusing to pay for austerity in their place. The policy of taxing the rich is not however what really stands out in the ULA taxation policy. What stands out is the dog that does not bark, for what is most distinctive about tax policy in the Irish State is not its protection of the wealthy but its policy of minimal taxation of corporate profits. This is such an article of faith of the political system that there appears almost universal agreement that while children, the sick, elderly and disabled should suffer from austerity the richest corporations in the world should be protected from even the most modest changes to their taxation. The result is that the taxes paid by them have become voluntary contributions to facilitate the pretence that they are subject to rules and laws like everyone else. Yet the ULA budget proposals simply note that the policy of taxing multinationals at an effective rate of 4 – 7 per cent has failed to develop a sustainable economy. Some US multinationals pay even less than this. Two years ago it was reported that Google paid only 2.4 per cent on non-US earnings that were routed through Ireland to Bermuda. Apple is a pioneer of a tax strategy called ‘Double Irish with a Dutch Sandwich’ which routes profits through Ireland, the Netherlands and onto the Caribbean. The deliberate lack of controlled foreign company legislation allows the Irish State to collaborate with notorious tax havens to produce such results. Microsoft was reported in 2005 to have made a profit of over €682m on its Irish subsidiary and paid no corporation tax at all (as did Symantec between 2004 and 2005). The company at the heart of this tax structure was based in a solicitor’s office in Dublin. Facebook has five subsidiaries here but only two are required to publish accounts. This massive tax avoidance is central to the Irish taxation system yet it is ignored. There are no proposals to raise the headline tax rate, not even for Irish companies many of whom pay no corporation tax either. No proposals for controlled foreign company legislation, steps to tackle transfer pricing or suggestions to close tax breaks for holding companies. All the ULA proposals are aimed at individuals not business or corporations. Why? Why is there no proposal to increase taxation of multinationals? Or proposals to tax the IFSC through which billions are routed in speculation every year, the sort closely associated with the recent global financial crash? Perhaps the reason is revealed by the justification given by the Revenue Commissioners for continuing with a policy of encouraging corporations to set up their Headquarters in Ireland even though they recognise many pay no tax. They justify it on the basis that these companies may increase real investment later. It is therefore not just fiscal policy that is predicated on minimal corporate taxation but what is laughably called industrial policy, in fact the whole hope of economic growth to get out of the current slump. In essence the reliance on foreign investment is a testament to the continuing failure of native capitalism and a profound expression of its weakness. On this weakness has rested a weak working class and on it sits a weak left, unable to present a convincing policy of taxing multinationals lest they pack up and leave and add perhaps another 100,000 or so to the ranks of the unemployed. Would this be the result of an increase in corporate taxation? The truthful answer is that this would probably depend on how much it increased. Multinationals locate in Ireland for many reasons including market access to the EU, a relatively skilled and compliant workforce which speaks English and a general pro-business environment. The left can hardly claim that increased tax will not endanger the location of these multinationals because it cannot credibly claim that it would support the continuation of a pro-business political environment which, among other things, ensures the exclusion of union organisation in most multinational plants. Instead the ULA concentrates on income taxation and in doing so proposes measures that are radical only quantitatively but not qualitatively, in other words they are not in themselves socialist measures. Proposals for increased taxation of the rich have to some degree gone mainstream, supported even by millionaires, conscious of the need to fund their state. A financial transaction tax has been supported by Bill Gates and increased income tax by billionaires Warren Buffett and George Soros. Of course the support of the rich for increased taxation goes nowhere near where the ULA would go. It should however also not be forgotten that in Ireland as recently as the 1980s there was a marginal tax rate including PRSI of 72.5 per cent. In the US during the cold war a tax rate for income ranged up to 92 per cent and was still as high as 70 per cent in 1980. What matters fundamentally then is the mode of production. The ULA concentrated in its budget statement on measures purely to do with distribution. It did however raise the question of production and the way it did it will be looked at in the next post. We all know the arguments against such a policy – higher tax rates, especially for those at the top, will discourage work, investment and business creation. It would be tempting to dismiss such arguments except that Marxists believe that it is profits that regulate the operation and performance of the economy. Surely reducing the returns to profitability would reduce capital accumulation and economic growth? Research has shown however that the massive reduction in top tax rates in the English speaking world has not led to improved economic grow compared to countries without similar tax cuts. The reduction of top tax rates, which were over 70 per cent in the 1970s, by over 40 percentage points in the US and UK has not witnessed any more impressive growth there than countries which have not reduced the rates by such enormous amounts. This could be because high tax rates are not the disincentive claimed, that those affected are often not capitalists, that most profits are reinvested and not subject to income tax anyway, and that profits are determined by much stronger and more fundamental forces than taxation of individuals or taxation in general. Many people believe that those earning astronomical amounts of money simply want more of it because they are greedy, obscenely status conscious and engaged in grotesque exhibitions of conspicuous consumption. The ULA has put forward plans to raise taxation on the rich in order to “use the money for a state funded programme of job creation.” They state that the top 5 per cent hold 46.8 per cent of all wealth and have total net financial assets of €219.3 billion. These figures are taken from Credit Suisse ‘Global Wealth Report’ in November 2011. Elsewhere they quote a figure from the Central Statistics Office which estimates total net financial assets of €117 billion in 2010. If we assume non-financial assets (property) as 53 per cent of the total this would give a total wealth of €249 billion and that of the top 5 per cent at around €117 billion, over €100 billion less than they calculate from the Credit Suisse report. It should be kept in mind that all economic statistics are estimates and subject to all sorts of errors. One thing they are not is exactly right. The Central Statistics Office has revised its GDP figure for last year by €2.6 billion while the Department of Finance double counted and found itself €3 billion better off. How much more is this the case when the very rich seek to hide as much of their wealth as possible, which varies as the various markets go up and down, including the stock markets and currency markets. Looking at the Credit Suisse report I calculate the wealth of the top 5 per cent at ‘only’ €185.7 billion instead of €219.3 billion. One more check available that I am aware of is to look at the ‘Wealth of Ireland’ report published in 2007 which recorded it at the height of the boom. If we assume a fall in property prices of 50 per cent and its estimate of the share of the top 5 per cent at 40 per cent we arrive at a figure of almost €206 billion. This however excludes the fall in value of shares, which dropped by 47 per cent between September 2007 and November 2010. If we assume that equities were 40 per cent of financial assets the value of wealth becomes €188 billion. This discussion only goes to show the uncertainty involved. We will therefore go with the ULA budget statement number of €219.3 billion without any illusion that it is exactly right. The ULA proposes an annual wealth tax of 5 per cent which would bring in roughly €10 billion a year (219.3 times 5%). It also proposes that those earning over €100,000 should have their taxes increased. 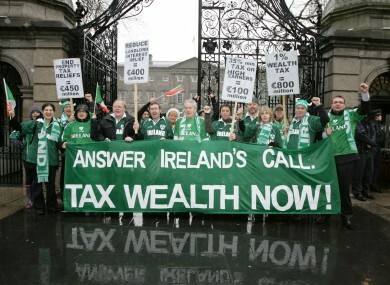 These people, it says, have a total income of €20 billion and paid €4.86 billion in income tax. This should be increased by a further €5 billion. The ULA also sets a target of an additional €2 billion to be taken from the super-rich tax exiles. Thus an extra €17 billion would be raised per year which, allied with refusal to pay for the bank debt, would be used to reverse cuts in social welfare, abolish the Universal Social Charge, increase tax credits for workers and reverse cuts in health and education etc. Firstly the sums involved. The proposals above, where they to come in on plan, would raise €17 billion yet the budget deficit in 2010 excluding the bank bailout costs was €17.4 billion. There would therefore be no room for closing this deficit while also funding the state-led investment programme of over €5 billion per year, which the ULA statement said was to be partly funded by tax increases. This also ignores reversing the €12 billion of cuts etc. which took place before and during 2010 in order to arrive at a deficit of ‘only’ €17.4 billion at its end. The second is the nature of the wealth. Roughly half the wealth is in financial assets and half in property. The financial assets will be in cash and bits of paper like shares which can be sold for cash. To turn this wealth into money that can be used to pay workers to provide services, reverse workers’ tax increases and procure services it will be necessary to sell these bits of paper after the wealth held as cash is exhausted. The value of these bits of paper, such as shares, may very well fall if a lot are sold at one time or it is known that they cannot be held and sold at what might be considered by their owners as the most favourable time. The value they are held and valued at may therefore be greater than what could be got in a sale. Everyone is familiar with this because of NAMA and the property collapse. How much more of a problem is this for that half of assets which is property? And there is an additional issue. Who would the State sell these assets to? Workers, self-employed, farmers and small businesses are in no position to buy these assets. In fact only Irish and foreign rich would be in a position to buy. But when we consider this for a moment, how would the Irish rich afford to buy these assets when these assets are being taken off them in the first place? This leaves only foreign capitalists. Putting it like this, selling off Irish assets to foreign capitalists to finance State expenditure doesn’t look too much different from what the Governing parties want to do. Perhaps it is proposed that they too are taxed on Irish assets, in line with the policy on taxation of Irish assets held by tax exiles, but this then only puts them in the same position as the Irish rich. Why buy assets that are going to be taken off you in tax? Making the most simple assumption that a wealth tax would remove an equal amount of the wealth each year, with a wealth tax of 5 per cent the total wealth of the rich would be cut in half in ten years. Ten years later it would be gone. Even with wealth growing at say 2.5 per cent a year, and a wealth tax that took 5 per cent of what was left from the previous year, the wealth of the rich would still be halved in less than 23 years. In other words this is not sustainable and anything not sustainable collapses long before the final step is taken. An unsustainable tax base based on property is replaced by an unsustainable tax base constructed on wealth taxation. The ULA proposes that those earning over €100,000 pay an additional €5 billion in taxes above the €4.86 they are currently paying, on a total income of €20billion, doubling their taxes and moving to an effective tax rate of half of income. The ULA give the example of the top 0.5 per cent who have a current average after tax income of €400,000 each, which after the implementation of the ULA proposals would reduce to €166,000 each. This is a reduction of 58.5 per cent in income. This won’t work because of reason four. The ‘Sunday Independent’ rich list published in March this year records that the richest man in Ireland is Pallonji Mistry, an Indian tycoon with Irish citizenship, worth €7.4 billion. How long does anyone think he would hang around if he thought the Irish State was going to take half his wealth off him within ten years and reduce his income by nearly 60 per cent? How many others of his fellow rich would do exactly the same as him? The ULA have said they have plans to get €2 billion extra out of Irish tax exiles and propose various measures to get this €2 billion. Unfortunately they have said that “it is impossible to predict the revenue which would be generated by the above measures” which is tacit acknowledgement that they have little confidence that these measures could be effective. They refer to the US and its expectations that its citizens will pay US income tax on earnings abroad but the Irish state is not the US state. It says that its demands are reasonable but whether workers believe them to be or not, the rich do not and become tax exiles to avoid tax. They will not be swayed by ‘reasonable’ demands that they pay up and the ULA knows this. The ULA has said that even if such people move liquid assets out of the country, as will non-exile tax payers, the tax can be taken from the value of their fixed assets in Ireland. But this leads us to the problems involved in reason two above. The idea that the wealth of the rich can be taken by taxation is fine only if one believes that they will not resist with every weapon in their armoury. The budget statement mentions that there is an investment strike by private investors as if it were some wilful act and not a perfectly rational response to the recession. Yet serious attempts at taxation of the rich really would produce wilful acts and private investors would use their ownership of assets to reverse investment and sabotage the economy. Marxists have always been aware that in the class struggle the capitalist class have usually demonstrated much higher levels of class consciousness than workers and their superior organisation will see them able to avoid a great deal of taxation, especially when it becomes worth it. Their success in this is guaranteed by reason five. The ULA have stated that “it is a matter for government which has Department of Finance, Revenue Commissioners, Central Statistics Office etc at its disposal to devise legislation to reach the target revenue of 10 billion from the top 5 % and that, in particular that the homes, farms and pension funds of those outside the top 5% be exempt.” But this is the State that has given rich tax fraudsters two tax amnesties on top of all the various tax incentives and loopholes! As a Marxist I believe that the state is an instrument to defend and protect the capitalist class, that it is therefore a capitalist state. I believe that the bail out of the banks even at the cost of bankrupting the state itself is testament to how far it will go to do this. The recent history of attacks on the working class in order to spare the rich are further examples and are the result not of a policy whim that can be changed but a result of the structure of the state, economy and society. The proposals of the ULA rely on all this being mistaken. I remember listening to Today FM and an American writer on financial affairs, whose name I did not hear, being interviewed about the situation in Ireland. He remarked that Ireland was no more corrupt than many other countries but that what really set it apart was that no one ever seemed to get punished for all the corruption. Yet the tax plans, and others, of the ULA depend not only on the Irish State not defending the rich but instead actually defending the working class. The taxation proposals of the ULA are clearly presented as eminently reasonable and practical. However what is reasonable is decided by class struggle and class struggle means they are not practical.